Happy Holidays: I have installed Hillside Shopping Centre's Christmas display. I have installed Hillside Shopping Centre's Christmas display. 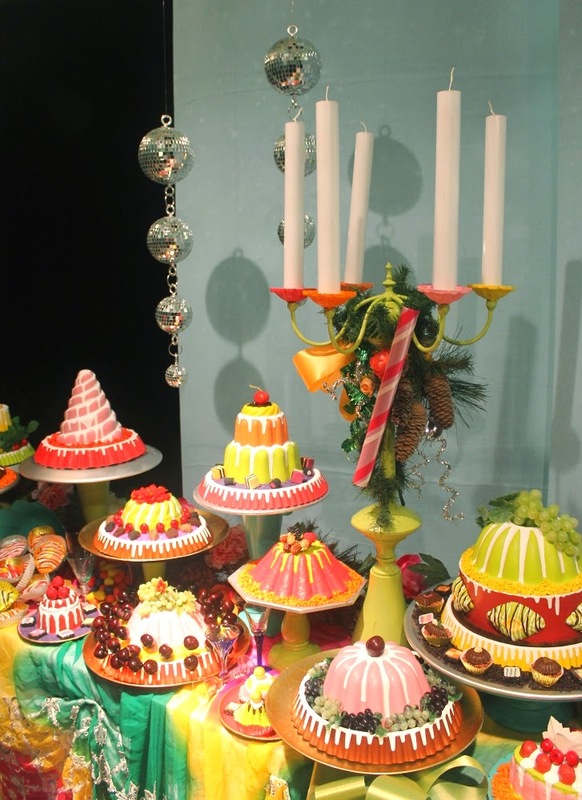 I am totally fascinated with cakes, pastries, and food presentation from the Edwardian era and earlier. I also love contemporary French pastries. Check out these past blog posts about cakes and pastries here, here, here, and here. 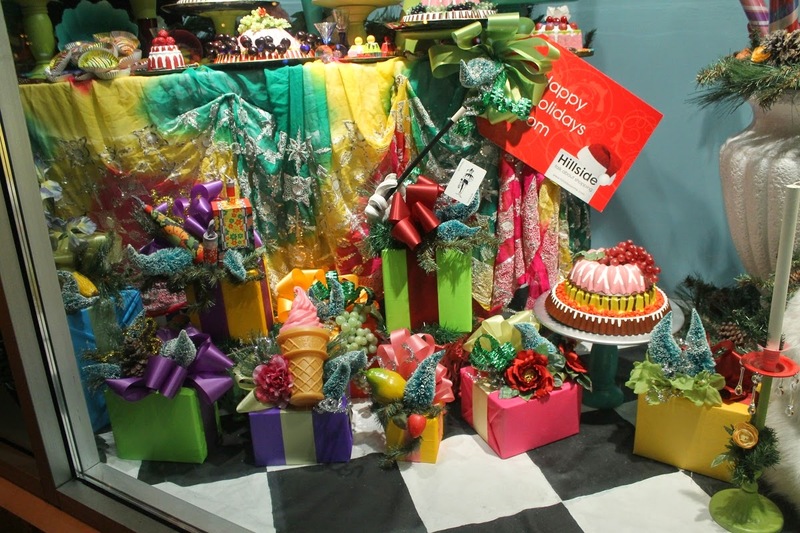 The summer window that I created for Hillside had a few cakes and pastries in it; I wanted to expand on this theme for this year's Christmas window. All of the images are fairly large so click on them and browse to your heart's content! 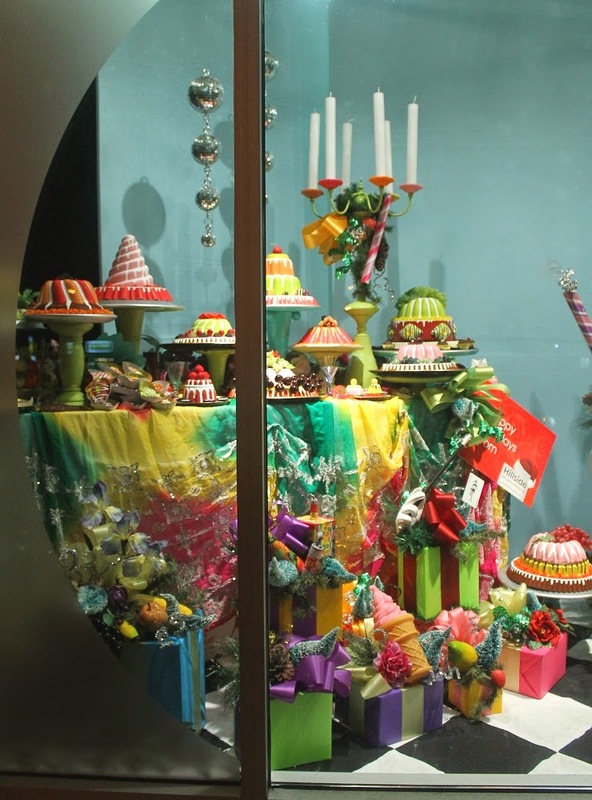 I took this photo inside the window so that you can get a better look at a selection of the delectable treats. The colour scheme was completely influenced by the cakes and pastries. I love bright colours and wanted to get away from the traditional red and green but still make the setting a Christmas fantasy. The gifts at the base of the table are wrapped in very bright plastic tablecloths from the dollar store. 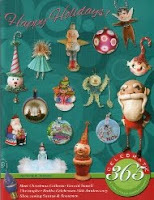 The tops are decorated with a variety of items that you don't readily connect with Christmas but the addition of silver or gold tinsel, ice encrusted evergreens, and whimsically bent bottle brush trees magically turns them into fantasy Christmas presents. The floor has a bold black and white check pattern to counter balance the bright busy colours. 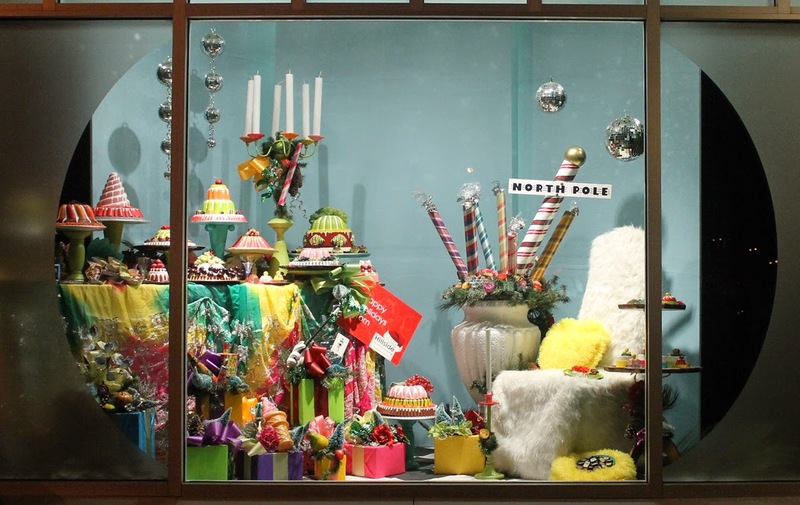 A look at the left side of the window with all of the desserts and gifts that would delight any child... or adult for that matter! The banquet table is covered with a beautiful tie dyed, embroidered, and bespangled sari. The right side of the window has a polar fleece covered chair/throne. Halfway through the installation of the window I had one woman mention to me that she would be back later for tea. Here is the finished window display. I had so much fun assembling this window. At one point I felt delighted and excited; I hope that the same feeling comes across to everyone that sees it. 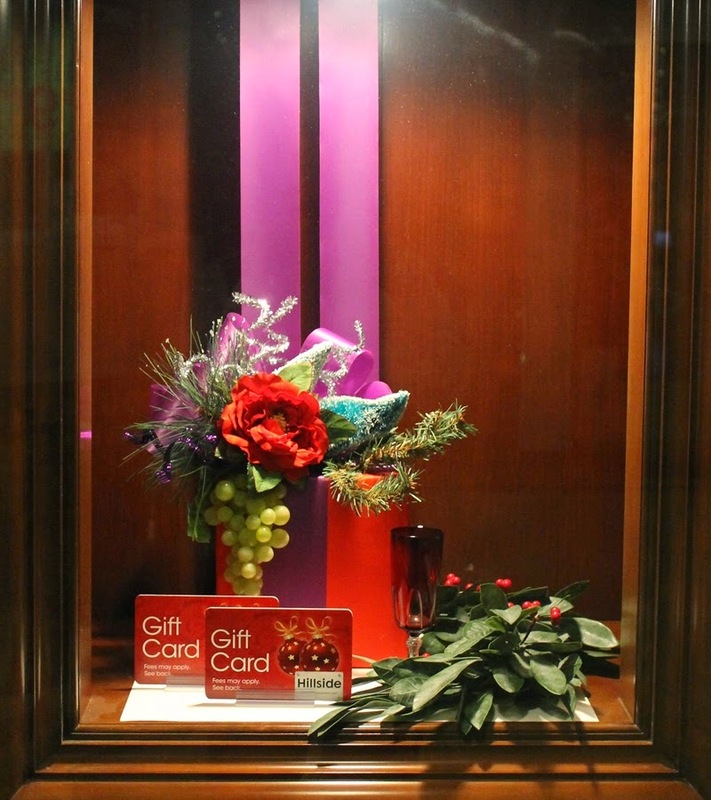 This small window display is for advertising the Hillside Shopping Centre's gift cards. I like the addition of the tinsel, bottle brush tree, and grapes; it helps to get rid of any stuffiness but still be elegant. I am off to my studio, it desperately needs a cleaning. Thanks Nancy. 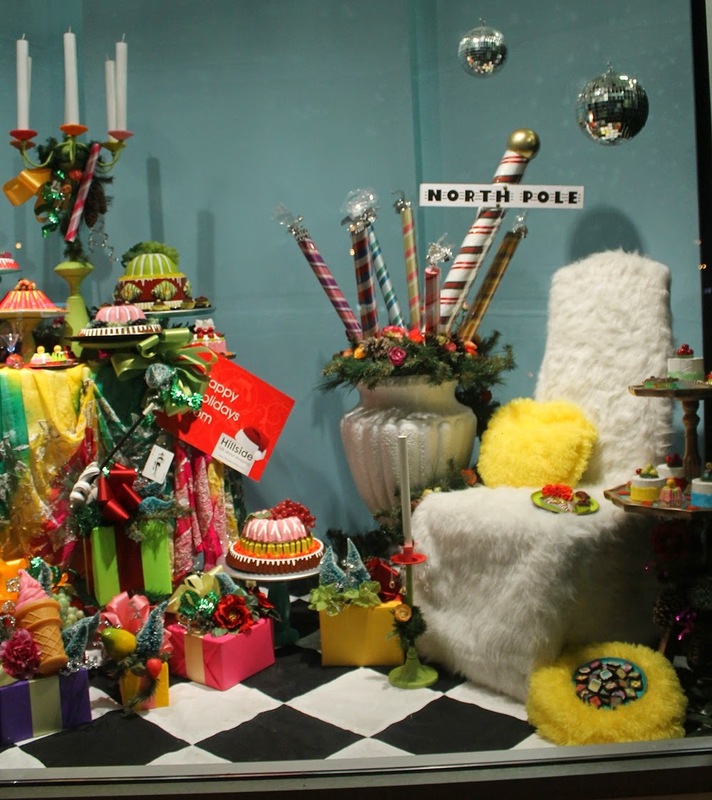 Making a window display is like putting together a 3D jigsaw puzzle. I find it exciting but after 10 hours it can be exhausting mentally. That sounds like a complaint but it isn't. Happy Holidays to Mr. Happy Holidays! Wishing you all the best in the New Year, Len. Enjoy. Don't know if you saw my comment after yours - crocus report on my sidebar. They are springing up very slowly but I see some yellow! Gift Wrapped Boxes and Fancy Cakes.